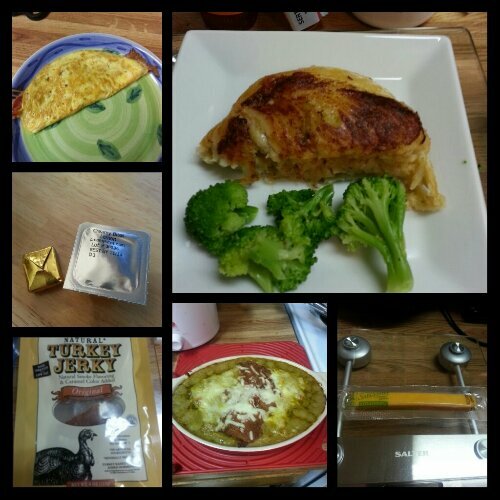 Today’s food choices, from upper left: one-egg omelet with bacon and cheddar cheese; Trader Joe’s crab-stuffed flounder and broccoli; Sargento reduced fat cheddar cheese stick; green chile chicken casserole; Trader Joe’s turkey jerky; multivitamin and calcium supplements x2. Not pictured: a serving of Rudy’s pinto beans with smoked turkey and ham (about 2.5 ounces). This Friday Five is another NSV edition because I seem to be having a lot of them lately. 1. Every day when I get dressed for school, I see in the mirror that my shape is changing drastically. This is encouraging. My upper arms are smaller around, my belly is starting to flatten out a little more, and my booty is considerably less plump than it was before. I can see that there is less fat in my neck area as well. 2. I am standing and walking around my classroom so much more than I ever have. This is a great thing for a few reasons: it means I’m not tethered to my desk or lab stool. It also means that I am out and among the kids, stopping behavior issues before they start–this is great since all my classes have 25+ kids in them this year. Finally, it means that my daily step count is going up, up, up! 3. I have hit 7000+ steps nearly every day this week so far. Monday was the exception because we were off and I didn’t purposely exercise here at home. Had I been at school Monday, it would have happened. I am going to find a way to make it happen tomorrow for sure. 4. My wedding jewelry is getting very loose. It’s not loose enough yet that I need it to be resized, but I think potentially by my anniversary in November it may need to be. My college class ring is also very loose and will need to be resized as well. My bottom half is definitely a different size than my top half. I wear a smaller shirt size than I do pants size which is frustrating because I can shop for tops in most places, but pants I still have to buy from places like Lane Bryant. I refuse to buy pants until I’m down another couple of sizes on bottom so that I can start shopping for them where I’ve been shopping for all my other clothes–Talbots. I tend to stray from dressing trendy–always have. My taste in clothes is much more classic and conservative than what most plus-size retailers sell to women of my size. I don’t anticipate that will change as I’m able to wear smaller sizes. I’ll dedicate another post to style and how I came to settle on what I like later on. I’m closing in on two months post-op, and life is pretty sweet at the moment. There is a guy in my Rotary Club who is also a post-op sleever who told me, “These first six months are a wild ride.” He was absolutely right–so far, these two have certainly been that, and a bit surreal. I am anxious to see what the coming months will bring. This entry was posted in daily bites, post-op, vsg, weight loss surgery and tagged clothes, daily bites, Friday Five, NSVs, post-op eating, post-op life, shopping, VSG, vsg realness, WLS. Bookmark the permalink. 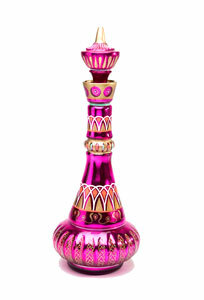 I hear you about the genie bottle! I have always been heavier down below, and I find that as I lose weight, my stomach is, well, deflating. It used to push out more, but now it is just providing more bulk below my waist. My stomach is finally starting to flatten out a bit! I didn’t think it ever would. But I know I’m always going to have hips and a booty. That’s okay with me so long as they’re not freakishly large, haha! I was always just kind of big and the same size all over. BUT, now I’m experiencing the same thing as you – smaller tops and bigger bottoms! Has to be all that lovely stomach fat/skin! Ugh! It’s encouraging to be able to find tops in most places though… we are on our way! !